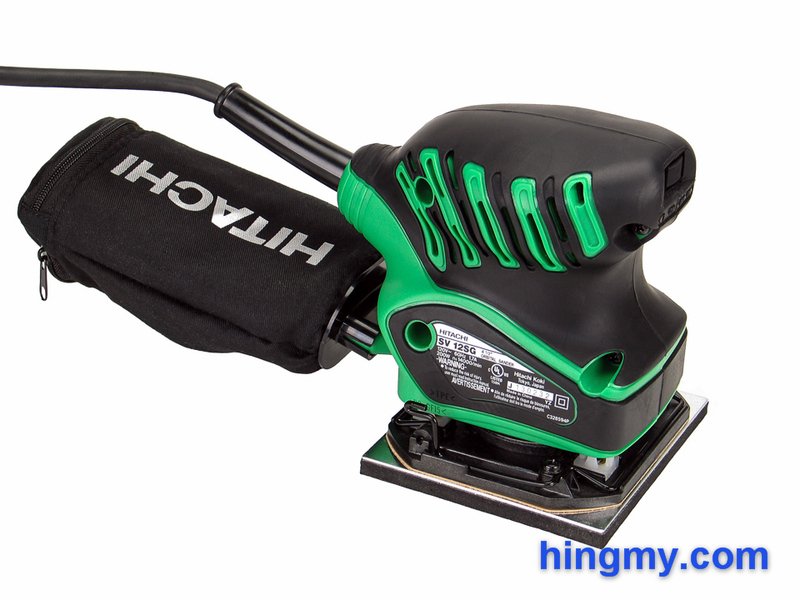 While writing last week's article, The Best Palm Sanders - 2014 Edition, I noticed I did not review Hitachi's SV12SG palm sander. I ordered one, and it arrived just in time for this week's review. All my palm sander specific hopes and dreams rest on this little green guy. Let's take a look if the Hitachi SV12SG can upset the palm sander rankings, or if it is yet another uninspired entry. 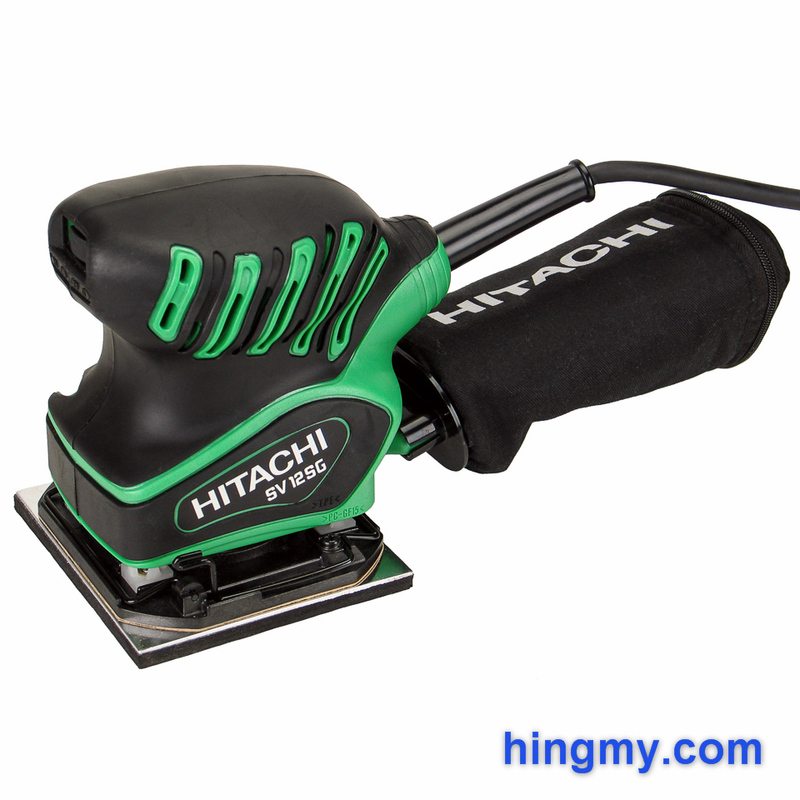 The SV12SG is a 1/4 sheet palm sander from Hitachi. It follows the traditional design closely without innovating in even a single category. The wire clamps, sub base, knob handle, and power switch are exactly where you'd expect them to be. The 1.7 amp, single speed motor sits right in the middle of the performance charts as well. Only the top speed of 14,000 rpm comes in as the best value among palm sanders tied with a multitude of competing models. Build quality is very good in typical Hitachi fashion. 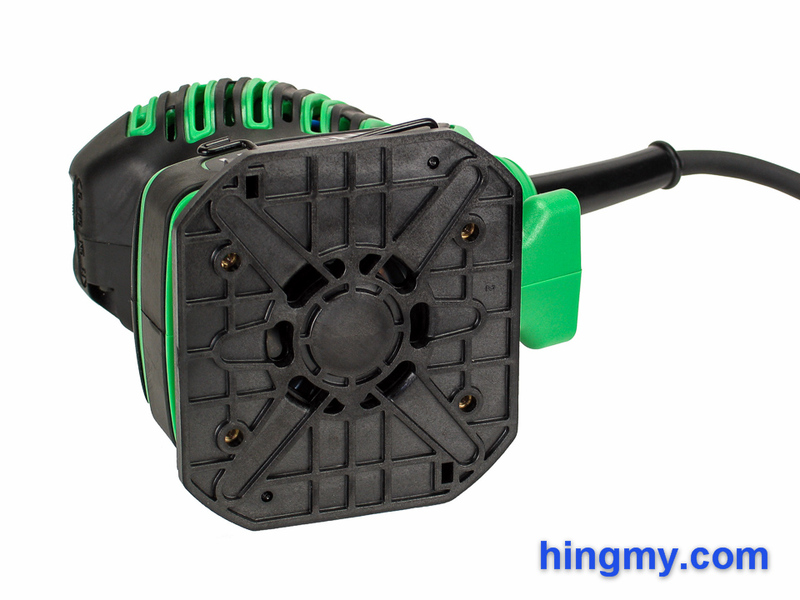 The green, hard plastic body of the sander is liberally covered with pleasant, black rubber. The knob at the top of the sander is the primary handle. The series of vents that run along the sides of the knob like the stripes of a tiger, give the knob a textured feel. When sanding up against a wall there is enough room for the operator's fingers on the sides of the knob, but there is none in the front. This is not the sander for you, if like to wrap your fingers around your palm sander front-to-back. The SV12SG is a capable sander, but the way it performs hardly matters when you consider that you can't connect a dust collection hose to its oval dust port. The power switch in the nose of the sander is functional, but very little else. It is not protected from dust, and not particularly tactile when being actuated. The sander turns on when it is plugged in while the switch is in the On position. The 8ft power cord, on the other hand, is of significantly higher quality. Made from stranded metal and covered in rubber, the chord lies flat and coils easily. The wire paper clamps follow the traditional design without any attempt at innovation. Tension in the wire presses the jaws of the clamps tightly against the sub base. The resulting force secures the paper on the base plate without the any possibility of movement. Due to the tight tolerances of the mechanism, care must be taken to precisely quarter each sand paper sheet. A properly sized 1/4 sheet mounts on sander with a 1/16 of an inch of paper showing behind the clamp on either end. Getting the paper installed with so little margin of error takes some time and patience, but ultimately does not result in a loss of functionality. Unfortunately all this aggravation does not translate into the SV12SG sanding any faster. The sub base of the SV12SG is the best I have ever seen on a 1/4 sheet palm sander. Both the metal plate and the foam layer are thicker than the competitions' by a wide margin. Similarly the hole punch that comes with the kit is made from metal, a significant improvement over the competition's plastic version. In the woodshop the SV12SG turns in a competent performance. Its average size motor and great top speed translate into good, but not stellar numbers. It'll get the work done just as fast the competition, but any advantage it has is so small its not worth quantifying. Surface quality is excellent, if you make your way through the grits of sand paper. Swirls disappears from sight at #120, and from touch at #220. Like most palm sanders the SV12SG takes a little longer to get to finish-ready surface quality than a random orbit sander. Operating noise is unfortunately a little above average. Hearing protection is a must, as is the case with almost every palm sander. Contractors working around occupied spaces should look for a different sander. The SV12SG passed our two-hour endurance test with flying colors. The handle got a little hot after a while, but the sander's performance never faltered. You can run this sander all day long on the job site or in a production shop. It'll perform well for a few years, but you'll have to replace it eventually. The dust collection system of the SV12SG can only be described as incomplete. The cloth dust bag works just about as well as similar systems from the competition. Most dust finds its way into the bag when it is clean, but airflow all but stops when the pores of the bag get clogged. The bag's ability to filter out fine dust is questionable. Even moderate movements of the sander are too much for the dust collection system to cope with. If you don't slow down, the sander leaves a trail of surface dust behind. Removing the bag reveals a proprietary oval-shaped dust port. The kit does not come with a vacuum hose adapter, and Hitachi does not sell one separately. I was unable to attach my shop vac to this sander, and yours won't fit either. As it stands, there is no way to operate this sander with efficient dust collection. You'll have to vacuum up the dust the SV12SG produces after your work is done. The SV12SG performs well in the woodshop, but the unnecessarily complicated paper clamps and missing dust collection adapter make it a poor value for just about everyone. The things it does well, the competition can do just as well. A few well engineered components can't save it. Unless you find this sander at an incredibly low price, I simply see no reason to put up with a sander than cannot be connected to a dust collector. One missing accessory turns what would otherwise be a good palm sander into one of the worst tools I have reviewed this year.